See how to scratch-build an out-of-service train order signal in the February 2012 edition of Model Railroad Hobbyist magazine. Click hear to read the article: http://model-railroad-hobbyist.com/magazine/mrh-2012-02-feb/train_order_signal. 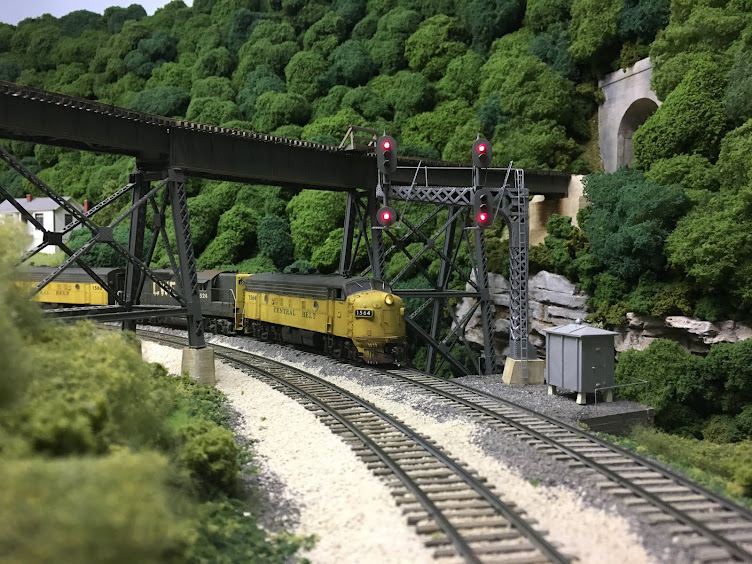 Since I posted a portion of the Part 4 update over on the Model Railroad Hobbyist forum, there's been an interesting discussion regarding dirt and gravel road, including some shots of the beautiful dirt roads that Charlie Comstock did on several of his modules. You can see the discussion and the photos here: http://model-railroad-hobbyist.com/node/6741?page=2. Based upon the comments and discussion, I made some changes to the dirt road and gravel area around SJ Cabin. I am reasonably pleased now with the color and texture variations, which you can see in the photos below. As I mentioned in the post on the MRH Forum, my interest in this project is waning and I'll come back at a later date and add the final details. My next project is 3 Atlas wide vision cabooses that have been painted for the home road and are ready for weathering. Once these are complete, I'll post a blog that compares them to the caboose seen in the photo above. It's one of 4 Athearn wide visions cabooses that I heavily modified back in the mid-1980's. While they have stood the test of time in terms of appearance, they were five times the work that the Atlas cabooses have been. More to follow on this project. After the last post, Jason Lachlan suggested the addition of some rock outcroppings in this area. He sent along some great photos , and I spent a bit of time debating whether or not to add such a feature in this area. I finally decided to move on with the original plan and perhaps add some rocks a little further toward the engine service area later. I put down some static grass in several small areas, however, once the glue had dried I wasn’t entirely pleased with the results. I’m relatively new to static grass and don’t have a lot of experience with the material. This time around I got too aggressive and ended up dumping a bit of it versus letting the static electricity pull it out and stand it up on the surface. As a result, a bit of the grass laid flat in the glue and the coverage was a bit thin. I left this area alone for a week or so, periodically looking at it and then looking at several other areas where the grass went down nicely. I finally decided that the new grass had to go. The photo below shows one of the areas after I had scraped up the static grass and re-painted the area with dark green paint. While the paint was drying on the two areas where I scraped up the static grass, I started putting bushes in place as you can see in the photo below. The next two photos show the static grass that I reapplied after the paint had dried. I’m using a 50/50 mix of 6mm Silfor Spring and Noch Wild Grass light green. I brushed on a 50/50 mix of white glue and wet water to secure the grass.I went slowly this time, tapping the side of the applicator and making sure that the screen was about an inch or so from the surface. After the static grass had dried, the rest of the bushes were added. The signal cabinet is stand-in to measure the width of the dirt road in this area. At this point I began to work on the area around the culvert leading from trackside. I started with the base of the culvert. Several years ago I went to a local stream with a coffee can and small shovel and gathered up a bunch of rocks and small gravel from the stream bed. Once the material had dried, I sifted it in ever increasingly small strainers. I eventually wound up with a nice variety of rock sizes, and the photo below shows the two smallest sizes. The next two photos show the application of the two sizes of rocks pictured above. I added one more layer of slightly larger rocks as can be seen in the next photo. After I took the photo, I removed some of the larger rocks as they appeared a bit too big. Once I was happy with the look and shape of the culvert bed, I applied 70% isopropyl alcohol followed by a 2:1 mix of wet water and white glue. Once the glue had dried, I applied a dusting of Joe Fugate’s zip texturing weathering powders to help blend in the rocks. For a detailed explanation of this technique, see the November/December 2010 edition of Model Railroad Hobbyist e-zine. Back issues can be found at the following link: http://model-railroad-hobbyist.com/magazine/back-issues. I used the dirt and grime mixture that Joe described in his Ten Mile Creek video series which consists of 1 part black, 1 part brown, 1 part yellow and 4 parts plaster of paris. This appeared a little too dark to me when mixed, so I add 2 more parts of plaster. Once the weathering powder had dried, the bottom of the culvert appeared too dark. To lighten it up and add some variation in the color, I dry-brushed a dark brown thinned latex paint that I use for rock coloring. The photo below shows the final results. To complete the scenery, I added additional layers of ballast, dirt, gravel, and weeds. 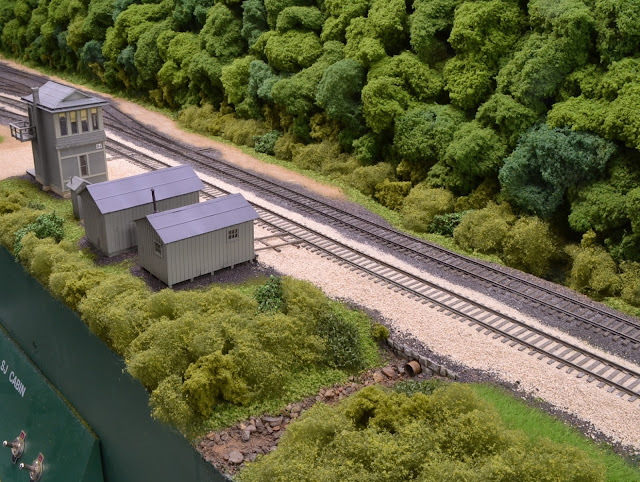 I took care to make sure that the cinder ballast around the sheds was up against the sides of the buildings. I also filled in the area between structures and the track with limestone ballast. The photos below show the finished scenery. The last step in completing this scene will be to put a final coat of paint on the fascia, weather the track and add details such as barrels, a switch motor, ties between the track where the motor car rails end, and other assorted odds and ends. As always, thought, comments, and criticisms are welomce.